Great close-ups were had of this North American Buff-breasted Sandpiper on Marazion beach in Cornwall at the weekend. This adult bird was happy to feed amongst the seaweed only a few metres away from several crouched bird photographers. Turnstone which were accustomed to the stream of holidaymakers walking by. Originally, the hope had been to see the Baird’s Sandpiper that had been reported but the disappointment of not seeing it was tempered by the best views I’ve ever had of the Buff-breasted. In America small Sandpipers are often lumped together and known as ‘Peeps‘ and can be very difficult to identify. 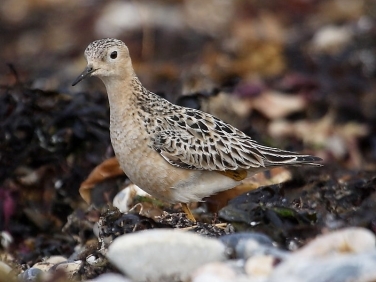 However, the Buff-breasted Sandpiper is slightly larger, at about 20cms, than this group and the unstriped buff coloured breast with a small patch of speckling on the sides is usually sufficient to identify both juvenile and adult birds. These are North American birds which are annually recorded in small numbers in the UK. They have a preference for short grass fields as well as mudflats and seashores where they feed on a variety of invertebrates.